An Clupeonella cultriventris in uska species han Actinopterygii nga syahan ginhulagway ni Alexander von Nordmann hadton 1840. An Clupeonella cultriventris in nahilalakip ha genus nga Clupeonella, ngan familia nga Clupeidae. Ginklasipika han IUCN an species komo diri gud kababarak-an. Waray hini subspecies nga nakalista. ↑ 1.0 1.1 "Clupeonella cultriventris". IUCN Red List of Threatened Species. Version 2012.2. International Union for Conservation of Nature. 2008. Ginkuhà 24/10/2012. ↑ 4.0 4.1 4.2 4.3 4.4 Whitehead, P.J.P. (1985) FAO Species Catalogue. Vol. 7. 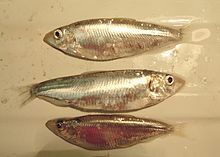 Clupeoid fishes of the world (suborder Clupeioidei). An annotated and illustrated catalogue of the herrings, sardines, pilchards, sprats, shads, anchovies and wolf-herrings., Part 1-Chirocentridae, Clupeidae and Pristigasteridae. FAO Fish. Synop. 125(7/1):1-303. Ini nga pakli kataposan nga ginliwat dida han 14:09, 5 Abril 2017.